Who let the pets out? July 30  Boarding a pet while you go on vacation aint kibbles and bits. A good kennel can cost upwards of $20/day; if you prefer to have a sitter visit your home it can come to a whopping $90/day. So, many pet owners are doing something that would have been unthinkable a decade ago: taking Fido with them when they vacation. MOST HOTELS still do not accept pets, but theres a growing segment of the travel industry actively courting pet owners with special rooms, facilities and even tours for animals and their masters. Finding these specialized lodgings and programs has never been easy, but recently a spate of pet-centric websites have emerged, some of which can be quite useful. Pets welcome is the webs largest resource for pet friendly travel, and its absolutely free. An informative site with a strange sense of humor (the management link reveals those in charge of the site to be dogs and cats who, among other things, are upset peeves are called pet peeves), it lists 25,000 pet friendly hotels, B&Bs, campgrounds, and beaches in the US, Canada, France, and Great Britain. You didnt know dogs can shop in Paragon Sports in New York City? Or get served food in a doggie dish at the Empire Diner? PetsWelcome lists these and other pet-friendly department stores and restaurants. Does Mr. Bigglesworth, Orson, or Bobo want to share a cultural experience with their owner? The Boston Pops and a baseball game in Chicago are just two of the events listed. Online booking for many hotels is available, and PetsWelcome.com claims to provide discounted rates. Writer Anthony Curtis answers your questions on Las Vegas. Submit your questions now! This next site lists 6,000 accommodations around the globe that are pet-friendly; and it provides more international listings than PetsWelcome (want to go to Ireland with your Irish setter? No problem, there are three hotels listed there where pets stay at no charge). Travel Pets also offers a free newsletter that contains travel tips and pet travel ideas. Pet owners booking online receive a discounted Internet booking rate through travelnow.com, which sometimes (but not all the time) saves money. Run by Dawbert Press, the publisher of Pets on the Go Travel Guides (Amazon.coms #1 Best-selling Pet Travel Guide), Pets on the Go lists 18,000 pet-friendly B&Bs, inns, motels, hotels and resorts. Advice, travel tips, pet-events and tours are archived. There is a membership available for $14.95 a year, but most parts of the site are accessible to non-members. Members receive enhanced features on the site (access to some more articles and information) and discounts up to 50 percent off accommodations, rental cars, and pet products. Our final site only lists lodgings, but differs from the rest in offering private homes and apartments for rent. There is also an emphasis on bed and breakfast accommodations. Sometimes these more private, personal lodgings may be more comfortable for pets not used to travel. No matter what site you use, always check directly with the pet-friendly place you select, in order to make sure the pet policy hasnt changed (Toto doesnt like getting rejected at the door). The cost: About a $100 a day, much less for day trips. 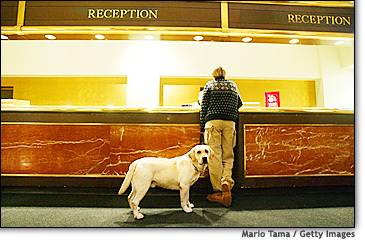 Finally, be sure to inquire about extra pet fees or deposits at any hotel or lodging before you book. Often, a hotel will require a deposit, refundable if there is no damage to the room. These can range from $15 at a bed and breakfast to $500 at some of the more luxurious hotels. However, sometimes a non-refundable fee is required; at some more expensive properties, this may be excessive (up to $500!). Some places will require an additional cleaning charge. Also, be sure to ask about any restrictions (some properties dont allow pets to be left alone in a room). When travelling internationally, make sure to find out what restrictions and requirements apply for animals before you leave. You must obtain a health certificate filled out by a veterinarian accredited by the U.S. State Department of Agriculture. Other countries, especially island nations, have strict quarantine laws that can hold your pet for up to six months. One exception is the UK, which has recently eased their quarantine laws. Your dog or cat can now enter the UK without being quarantined provided that it is fitted with a microchip, is up to date on its vaccinations, undergoes a series of blood tests and has a health certificate. Fulfilling those requirements doesnt come fast or cheap. Check the USDAs website for other restrictions that may apply and for an accredited vet in your area: http://www.aphis.usda.gov/travel/pets.html. Like this story? Have the travel news delivered to your inbox every morning. Click here to sign up for our free e-mail newsletter! So pets, tell your owners they dont need to leave you behind. With a pet carrier and a reservation at a pet-friendly hotel, animals and their owners can say goodbye to kennels and pet-sitters. From watersports and skiing to sightseeing and beachcombing: Theres a vacation out there for both the animal and the animal lover. Copyright © 2003 Newsweek Budget Travel, Inc.
 Who let the pets out?